THIS WEEKEND’S SINN Féin Ard Fheis is under way in Dublin’s Convention Centre this evening, with over 2,500 people expected to attend over the weekend. Sinn Féin Leader Gerry Adams said he is not concerned that Fianna Fáil and Fine Gael’s “neverending saga” of talks will overshadow the some 120 motions being discussed this weekend. Adams did have some advice for those in the ongoing talks in Trinity College. He said if Fianna Fáil and Fine Gael cannot agree on a minority government soon, there will have to be a general election. I don’t think there is any other option but to call a general election… but we’ll give them a grace for another short time. Deputy Leader, Mary Lou McDonald said the last eight weeks “have seen farce on a grand scale played out between Fine Gael and Fianna Fáil”. Ireland has moved on but it seems that the old guard politicians haven’t caught up. They indulge themselves and each other in a fiction of difference.They protest, there are fundamental points of difference between them. They protest too much! McDonald said the point of difference between Kenny and Martin is “which of them is top dog”. Whilst Enda Kenny and Micheál Martin and their colleagues jockey for position, holding the Dáil to ransom, in the real world life continues apace.The big issues of the day are left to drift. McDonald reiterated her party’s stance that it will not prop up a Fine Gael government. We will not play the game of make believe that Fianna Fáil are acting responsibly or in the ‘national interest’. They act only in their own narrow self- interest. Fine Gael and Fianna Fáil want it all their own way. They have made it repeatedly and abundantly clear that they don’t want Sinn Féin in government – we are not worthy it seems. In his keynote address, Martin McGuinness said this year’s Ard Fheis is about remembering the envisaged Proclamation 1916. Other parties pay lip service to the Proclamation. Some have had the chance to do something about it when they’ve been in power in Leinster House. But they chose cronyism over conviction. Golden circles over golden generations. McGuinness said his party was now in one of the strongest positions it has ever been in. There are now Sinn Féin councillors in every county in Ireland, bar two. He spoke about reconciliation and ending violence. We must also continue to face down the extremes within loyalism and so-called republicanism which seek to drag us back to the dark days of the past. All they offer us is fear, intimidation and pointless bloodshed. We have seen that in decent days and weeks with the murders of Michael Gibbon and prison officer Adrian Ismay in Belfast and the shooting of Harry Boyle in my own city of Derry. He said the people who carried out these attacks are a “blight on our communities”. 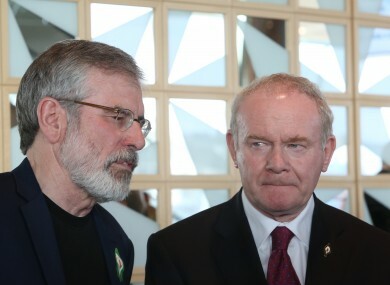 McGuinness added that their attacks are “futile” and without support. The weekend ahead plans to deal with a wide range of issues, including the health crisis, obesity issues and a drug policy review with a view to allowing cannabis for medicinal purposes. Email “Gerry Adams says FF and FG need to set a deadline or go back to the people”. Feedback on “Gerry Adams says FF and FG need to set a deadline or go back to the people”.